One of the best meals April’s had during her travels connects her to Barack and Michelle Obama. 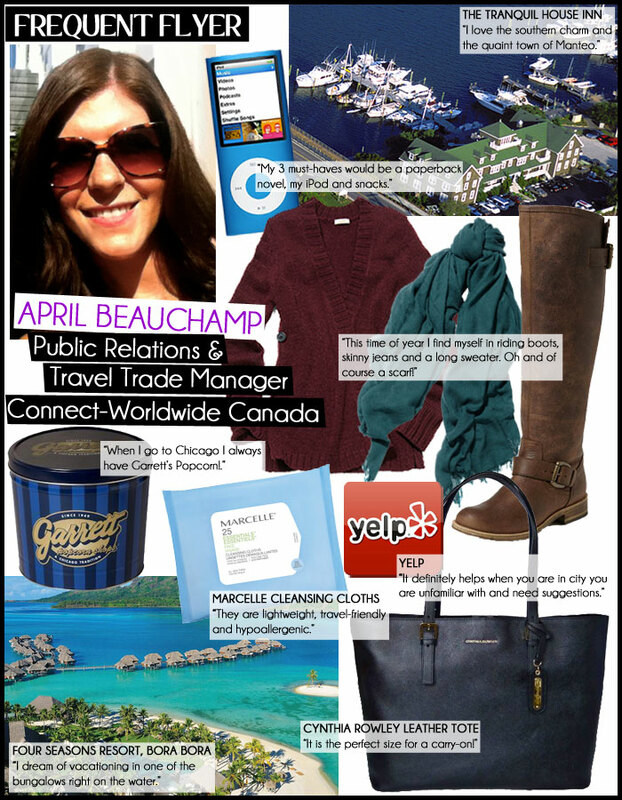 It’s quite possible April Beauchamp (@AprilBeauchamp) has inspired you to travel and you didn’t even know it. Though it may have occurred indirectly, as Public Relations and Travel Trade Manager at Connect-Worldwide Canada, April works closely with the media, airlines and tour directors to promote and create awareness of their impressive roster of clients, which includes destinations like NYC, Chicago, San Francisco, Arizona and North Carolina, to name just a few. We recently had the opportunity to get the scoop from April on what she travels with, some of her favourite travel memories and how one of the best meals she’s had during her travels connects her to Barack and Michelle Obama. Where was your last trip and what was it for? My last trip was in Montreal for business. I love the city, so whether I am there for business or pleasure I always enjoy myself. Old Montreal is one of my favourite spots, so I always try to stay close by. I love the culture, the boutique shops and the cafes. My latest carry-on bag is a black Cynthia Rowley bag. It is the perfect size for a carry-on! Lots of compartments, room for my MacBook Air and it looks great if I need to head straight to a meeting. What are the 3 most important things you put in your carry-on? I am guilty for stuffing way too much into my carry-on bag, but my three must-haves would be a paperback novel, my ipod and snacks. I like to have something on hand like a granola bar, dried fruit or almonds. I love to shop, so of course this doesn’t stop me at the airport. I usually find myself grabbing a coffee and browsing the gift shops and magazine stands. I always have a scarf with me when I travel. I am notorious for being cold, especially on a plane! Do you use travel apps? Any favourites? I have a few favourites actually. Skype is on the top of my list. I love being able to connect with family when traveling… and for free! One of my new favourite travel apps, is Yelp. It helps find the best local restaurants and provides great reviews. It definitely helps when you are in city you are unfamiliar with and need suggestions. The Tranquil House Inn on the Outer Banks of North Carolina is one of my favourite hotels. I love the southern charm and the quaint town of Manteo. Fill in the blank. When I go to _____ I always have _______! When I go to Chicago I always have Garrett’s Popcorn! I always travel with Marcelle facial wipes. They are lightweight, travel-friendly and hypoallergenic. Earlier this year, I went to Chicago on business, and stayed at the Trump Hotel. It was one of the most indulgent experiences I have had. The one-bedroom suite was stunning, the spa was breathtaking, not to mention the impeccable service from the staff. 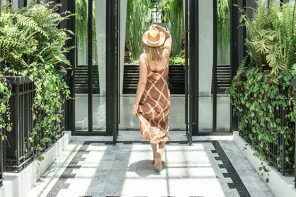 The hotel is surrounded by beautiful architecture, steps from amazing restaurants and only a few blocks from Michigan Ave. If visiting in the summer, you must check out the Terrace at the Trump, it has one of the best views in the city! What is your airplane style? I do my best to always look put together, but try to remain comfortable. This time of year, I typically find myself in my brown Steve Madden riding boots, skinny jeans and a long sweater. Oh and course a scarf! Best meal. Where did you have it and what did you eat? This is a hard question to answer! One of the best meals I have ever had was in Asheville, North Carolina. We had dinner at a restaurant called the Corner Kitchen. Which I learned, was one of Obama and Michelle’s favourite spots when they vacationed. I ordered the Pecan Crusted Mountain Trout with Sweet Potatoes, Green Bean Salad and Bourbon Sauce. It was absolutely incredible! My last vacation was a long weekend getaway with my boyfriend. We spent the weekend at the harbour village in Grand Marais Minnesota, located on the North Shore of Lake Superior. We stayed in a cute little inn on the water, drank wine, strolled through the town, and just relaxed. A few years ago I was a bridesmaid in my friend’s wedding in the Dominican Republic. There were about 30 of us for the entire week, and it was one of the best times I have ever had. We met some amazing new friends, and best of all, we were closed off for a week. It doesn’t happen often, so I love getting away and turning off my phone, with the only thing to work on is my tan! Wow, this is another hard question to answer. There are so many dream destinations I have on my bucket list. Right now, I have my heart set on Bora Bora! I dream of vacationing in one of the Bungalows right on the water.